"The Wild Beasts are calling on their way back from the fire." OK, that's almost the opening line to Duran Duran's Wild BOYS but the Wild Beasts do seem to be, er, calling. [and you are speculating that they are responsible for the recent spate of forest fires? - Ed]. Ever since forming in Kendal, Cumbria in 2002 (as Fauve), Wild Beasts have pulled off the trick of critical acclaim, industry accolade and airplay appeal. And they have built a stout and loyal following. Debut album 'Limbo Panto' was released in 2008 but it was 2009's 'Two Dancers' that set the industry alight (fire, see). Two Dancers was nominated for the 2010 Mercury Music Prize and collected album-of-the-year type nods from the NME, The Guardian, Q and The Sunday Times. 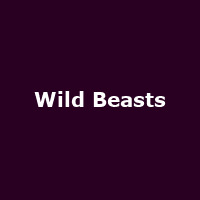 Wild Beasts had relocated to Leeds in 2005, released a couple of EPs, 'Esprit de Corps' and 'All Men', and were soon recording a session for Marc Riley's 6Music show. A contract with Domino Records followed and, as a wider audience was exposed to Hayden Thorpe's distinctive operatic vocal stylings, at least as accomplished as the widely lauded Anthony Hegarty (and his Johnsons), momentum built. Albums are all-too-often billed as 'eagerly awaited', a label which can denigrate the sense of anticipation surrounding records that create genuine excitement. But 'Smother', the third record from Wild Beasts, really has been eagerly awaited (it was released on 9th May). The band claims that the move to London from Leeds has brought a synth influence to their music and the initial response to Smother is enthusiastic. Calling it an album of 'extraordinary beauty', The Guardian said: "Smother isn't conventional chart material, but will make their burgeoning cult impossible to ignore". Following the release, seven dates have been announced for November with more likely to follow. The first is at the O2 Academy in Oxford on Friday 11th, moving on to Manchester, Nottingham, Southampton, London and Cambridge, and finishing in Brighton on 26th November. Tickets are on sale Friday 13th May at 9AM, starting at £13 + fees (£15 for London and Manchester). Tickets for their impending London dates have long-since sold out, but there are a handful of tickets available for their 13th May Gloucester gig (£13.50). The Wild Beasts are calling. Told you.